It's funny. When I became a parent, I started to see films about parental intervention in a new light. No longer was I automatically on the side of the child, but rather I began to appreciate where the parental unit was coming from. That's not to say that I automatically agreed with them, but I could see their own misguided attempts at love and protection manifest themselves in whatever abusive action that the youth deemed to be restrictive. No longer was it simply, no parties while we're out of town is fascist, suddenly, I had to take a pause and consider that perhaps that party will get out of hand and serious harm could befall the young, innocent child, who was suddenly a surrogate for my own child. Beast is not a film with a harsh palette of black and white, but rather the film draws inspiration from the many shades of grey that surround us every day. Moll is the young woman who is not as young as you might expect (27), but her isolation on a tiny island in the English channel stunts not only her emotional growth but also her ambition to break free from her overbearing mother. When Moll meets Pascal, a mysterious stranger to the island, she is able to break out of her doldrums for the first time and unleash her inner free spirit. But, not everything is as copacetic as it seems when Pascal becomes a suspect in a series of brutal murders on the island. I always find it interesting to watch a serial killer film set in a country other than the United States. Perhaps it's the fact that the United States is home to over two-thirds of the world's serial killers, but most serial killer films are set in America. So, when a film comes along that sheds light on the issue elsewhere, it's as novel and awe-striking as seeing a bullfight set in the Bronx. But the setting is key for this film as the island of Jersey (which also happens to be the home of writer-director Michael Pearce), is small and isolated from the rest of the world. In many ways, I felt the same tension about the location in this film as I did when I saw Insomnia. In Beast, the setting is not as much of a character in the film as it is more of a mood producer. It helps to sell the story because of the island's seclusion and tight-knit community. Also, the use of newcomer Jessie Buckley as Moll and criminally underseen Johnny Flynn as Pascal gives the story a touch of authenticity. Not only are we thrown off guard by the novel location, but the unknown actors give the story a punch in the gut that makes the ultimate reveal all that much more powerful. As I watched Beast, I was immediately struck by its apparent homage to Badlands which featured an equally young Martin Sheen and Sissy Spacek as young lovers pursued by the law. If the past is any indication, we are bound to see more of Jessie and Johnny in the future and that's a wonderful thing. Newcomer Michael Pearce has crafted a disturbing little psychological yarn that feels very personal. That's not to say that Michael knew his own version of Moll growing up in Jersey, but I don't think I'm taking too much of a leap in saying that Michael probably felt many of the same small island constraints that plagued Moll during his upbringing. Thankfully, Michael turned to filmmaking as his artistic outlet and we look forward to seeing where he will take us after this promising debut. If you are a fan of psychological introspections, then this one is for you. If the slow-burn of Insomnia is something that still haunts you to this day definitely check out Beast. While the film does offer several twists and turns, that whodunit mentality is not the primary focus of the film. Instead, it is a study in isolationism and familial bonds and their impact on personality and development. In some ways, although they are tonally much different, I saw a lot of The Witch when I watched Beast. I think Moll and Thomasin would have a bunch in common and would forge a deep, lasting bond if they ever came together. 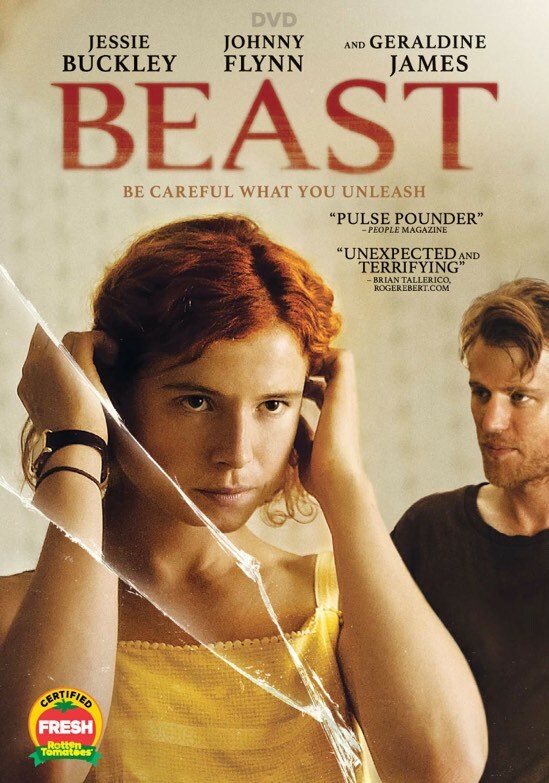 Beast is now available on DVD and Blu-ray.